A freighter passes below the Sunshine Skyway to the east of Fort DeSoto Park on a windy afternoon. Photo taken April 4, 2014. Interstate 275 in Florida loops through urban areas of Pinellas and Hillsborough Counties in the Tampa Bay area. The freeway joins Downtown Tampa with Downtown St. Petersburg while connecting Pinellas County with Palmetto and Bradenton in Manatee County. Interstate 75, by contrast, bypasses both cities to the east, doubling as a commuter route for Gibsonton, Brandon, New Tampa and Wesley Chapel and carrying regional traffic between Southwest Florida and the Nature Coast. Interstate 275 starts at a three-wye interchange with I-75 outside Palmetto and extends west through Terra Ceia to the tolled Sunshine Skyway Bridge across Tampa Bay. Northward the freeway winds through St. Petersburg to the eight lane wide Howard Frankland Bridge across Old Tampa Bay. The span turns I-275 east to Westshore in Tampa en route to the central business district and Downtown Interchange with Interstate 4. There the freeway turns almost due north through north Tampa to unincorporated areas of Lutz. Located along the Pasco County line at Wesley Chapel, the northern merge point of I-75/275 is known as the Apex. 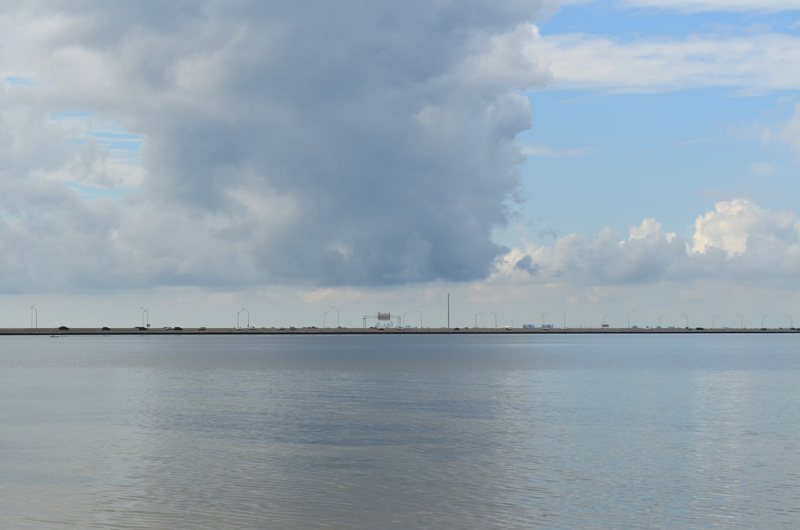 Looking southwest at the Howard Frankland Bridge from Cypress Point Park in Tampa. Photo taken October 19, 2013. The Howard Frankland Bridge initially opened with four lanes in 1960. A second span was added in 1990. A future project will replace the older northbound span with a new bridge, proposed for 2020 to 2025. 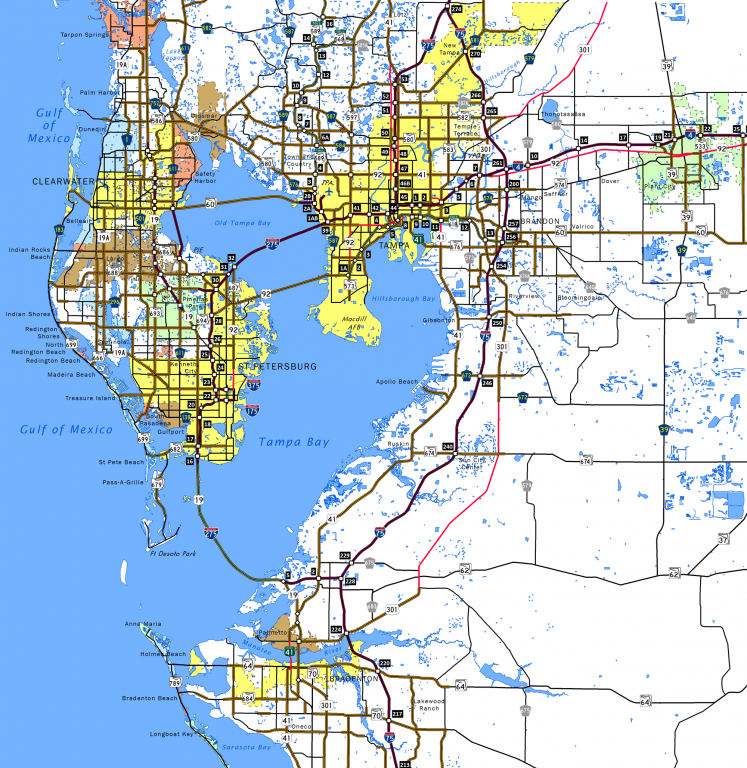 The Tampa Bay area is home to over 4,000,000. Clearwater anchors northern Pinellas County while St. Petersburg with its Downtown along Tampa Bay, spreads across the southern peninsula. Tampa, home to both MacDill Air Force Base and Port Tampa Bay, encircles Hillsborough Bay to the east, with unincorporated suburbs expanding outward to encompass Brandon, Riverview and Ruskin. The original layout for the Tampa Bay Interstate network took Interstate 4 west from Tampa to St. Petersburg and Interstate 75 south from Pasco County to an end at the Downtown Interchange near Ybor City. Changes were made in 1971, when I-75 was routed southward over I-4 west from Downtown Tampa to Pinellas as part of its extended alignment south to Naples. The eastern alignment of I-75 around Tampa Bay was given the designation of Interstate 75E. This change lasted just two years, when I-75 shifted eastward over proposed I-75E and I-275 was designated over the loop through both Tampa and St. Pete. Interstate 275 crosses the cable stayed Sunshine Skyway Bridge over the mouth of Tampa Bay. On May 9, 1980, the southbound span of the original Sunshine Skyway Bridge (a steel truss bridge) collapsed when the Summit Venture freighter collided with a bridge support. This led to two-way traffic on the remaining northbound span until the replacement was built. Ultimately, the old bridge was removed, though portions of the approach in both directions were retained for use as fishing piers run by the state park system. 1973 – Interstate 275 created when Interstate 75 is shifted from the St. Petersburg-Tampa route to the Tampa Bay bypass. At that time, Interstate 275 was complete from 38th Street North in St. Petersburg north to Lutz. The Sunshine Skyway also carried Interstate 275 shields. The portion of Interstate 275 between the skyway (near Maximo Point) and 38th Street North was unconstructed. 1975 – Interstate 275 under construction from 5th Avenue South north to 38th Street North. 1977 – Interstate 275 opened from 5th Avenue South north to 38th Street North in St. Petersburg. 1980 – Interstate 275 under construction from Interstate 75 near Gillette west to Terra Ceia. Tragedy struck I-275 when the ship Summit Venture collided with the original Sunshine Skyway. 35 people died in this accident, and one of the two spans collapsed. 1981 – Interstate 275 under construction from Maximo Point (northern end of the Sunshine Skyway) north to 5th Avenue. The northern terminus of Interstate 275 was extended up former Interstate 75 to near Worthington Gardens. 1983 – Two sections of Interstate 275 opened: the south interchange with I-75 and the section of I-275 from Maximo Point (northern end of the Sunshine Skyway) north to 5th Avenue South. 1984 – Replacement Sunshine Skyway (a new cable-stayed bridge) was under construction. 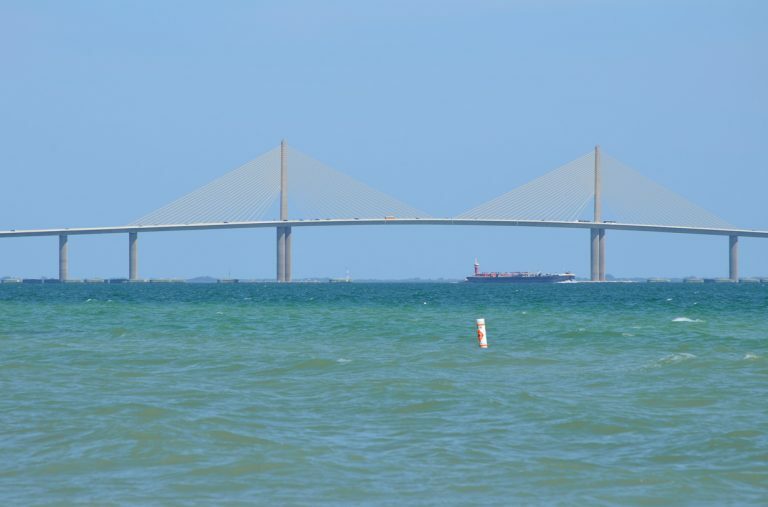 1987 – New Sunshine Skyway opened on April 30th. At that point, Interstate 275 was complete. Interstate 275 leaves the interchange with Bearss Avenue (SR 678) and continues north 6.1 miles uninterrupted to the split with ramps for I-75 north and Exit 59 to Florida 56. Construction between October 17, 2009 and September 17, 20122 added the new ramp for SR 56 at a cost of $32.7 million. Photo taken 04/25/16. Exit 59 takes motorists over the I-75 mainline to the adjacent northbound ramp (Exit 275) to Florida 56 for interests to Land O&apos; Lakes, Tarpon Springs and New Port Richey. The addition of this ramp eliminated weaving traffic between the I-275 north end and adjacent SR 56 off-ramp. Photo taken 04/25/16. Two lanes join Interstate 75 northward toward Ocala, Gainesville and Atlanta, Georgia. Exit 59 generally serves commuter interests to the burgeoning suburbs of southern Pasco County. Photo taken 04/25/16. An end sign for Interstate 275 stands at the gore point where traffic merges onto I-75 north. The freeway continues with six to eight lanes to County Road 54 at Wesley Chapel. Photo taken 12/14/16. Interstate 275 consists of a rural like freeway between Bearss Avenue (SR 678) and the merge with Interstate 75 north. A wye interchange facilitates the movements between the two freeways at the Pasco County line. Photo taken 05/28/05. A sweeping ramp joined the Interstate 75 mainline beyond the County Line Road overpass. The 2012-opened ramp to Florida 56 to Wesley Chapel joins a distributor roadway to the right of these end signs now. Photo taken 05/29/06. The previous set of end signs posted at the northbound merge of I-275 onto Interstate 75. I-75 continues 76 miles northward to Ocala and 113 miles to Gainesville. Photo taken 05/28/05. Four lanes of I-75 pass below SR 56 here on the 1.25 mile approach to the wye interchange (Exit 274) with I-275 south. Construction expanded Interstate 75 from four to six or eight overall lanes from north of County Road 54 (Exit 279) to a point just south of Florida 56 (Exit 275) between March 2011 and November 2014. Subsequent road work widened I-75 through the split with I-275 between October 2011 and spring 2016. Photo taken 12/14/15. Interstate 75 south swells to six overall lanes to accommodate commuter traffic from Wesley Chapel and Land O&apos; Lakes to the partition with Interstate 275. An arrow per lane sign appears as the freeway crosses Cypress Creek. Photo taken 12/14/15. Exit 274 was expanded to three lanes for Interstate 275 south into Tampa in 2014. I-75 curves southeasterly across New Tampa toward Temple Terrace and Brandon while I-275 straddles western reaches of New Tampa to the University of South Florida area. Photo taken 12/14/15. A former ground level sign posted two miles ahead of the Interstates 75 and 275 southbound split. Photo taken by Gene Janczynskyi (10/25/00). A diagrammatic overhead attached to the SR 56 overpass outlines the forthcoming wye interchange with I-275 south. The interchange with State Road 56 opened in March 2002. Photo taken by J.P. Nasiatka (06/30/03). One mile north of the I-75/275 split. I-75 sees one lone interchange within the Tampa city limits, in four miles at Bruce B. Downs Boulevard (CR 581) in New Tampa. Photo taken by J.P. Nasiatka (06/15/03). Interstate 75 southbound at Exit 274 (old Exit 57). I-275 enters the city limits of Tampa in nine miles. Another 174 miles of Interstate 75 await southbound motorists before the freeway reaches the city of Naples. Photo taken by Gene Janczynskyi (10/25/00). Passing over U.S. 41, a diagrammatic sign outlines the forthcoming three-wye interchange with Interstate 75. Photo taken 12/24/16. East of Frog Creek, I-275 enters the half mile approach to Interstate 75. Two lanes default onto the freeway south to Ellenton, Bradenton, Sarasota, Fort Myers and Naples. Photo taken 12/24/16. Passing under 36th Avenue East (former SR 683), the ramp for I-275 north to Sun City Center, Ruskin and Tampa departs for a high speed flyover. Two lanes otherwise continue onto I-75 south, with milepost zero posted ahead. Photo taken 12/24/16. The original diagrammatic overhead posted one mile out from the I-275 south end. Photo taken by Gary S. Peterson (01/03). Naples remains the control city for I-75 south from Tampa where the route ended until signs went up along Alligator Alley in 1991. Photo taken 12/00. Another set of original guide signs for I-75 posted as I-275 ends. All of the Interstate 75 guide panels on Interstate 275 were replaced by January of 2003. 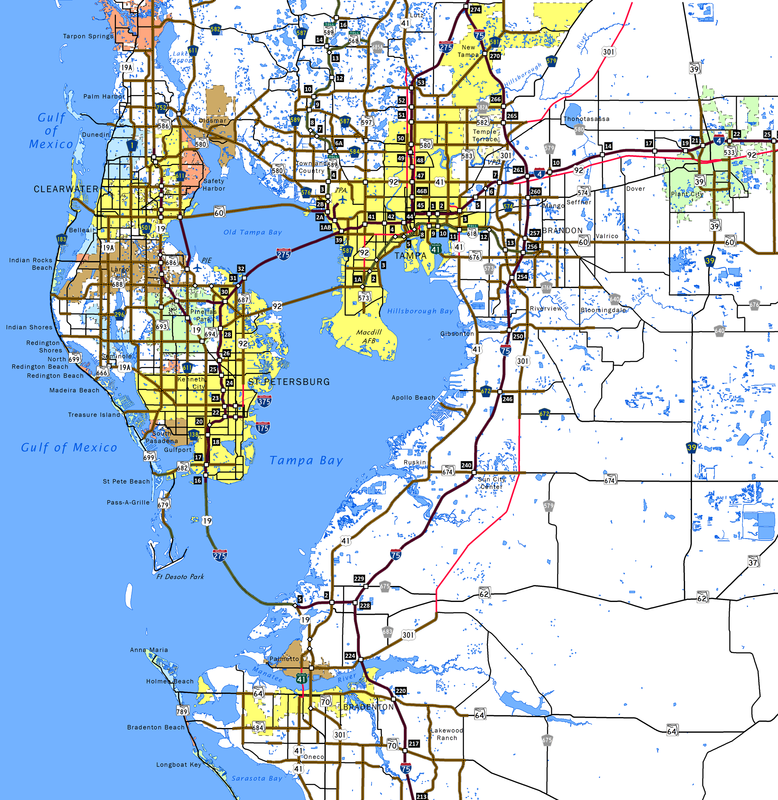 The city of Sarasota is 18 miles to the south while Fort Myers will be reached in 88 miles. Photo taken 12/00. Just southwest of the diamond interchange with Moccasin Wallow Road, I-75 quickly meets Exit 228 with Interstate 275 north. I-275 travels west to Rubonia, Terra Cela, and the Sunshine Skyway Bridge ahead of St. Petersburg. Photo taken 03/01/13. Exit 228 veers away from Interstate 75 south. Interstate 275 meets U.S. 41 just one mile to the west. U.S. 19 north merges onto Interstate 275 north at Terra Cela ahead of the Sunshine Skyway Bridge toll plaza. The two overlap northward to 54th Avenue South (Exit 17) in south St. Pete. Photo taken 03/01/13. Additional photos covering the Interstate 75 south approach to I-275 north posted at Interstate 75 South – Manatee County on AARoads. Interstate 75 north expands to four lanes on the one mile approach to Exit 228 with Interstate 275 west. I-275 joins Southwest Florida with St. Petersburg and Clearwater while I-75 continues north more directly to Tampa. Photo taken 09/28/13. Overheads attached to the 69th Street SE overpass directs motorists to the two-lane flyover for Interstate 275 north. I-275 leads west to Terra Ceia and the toll plaza for the Sunshine Skyway. Photo taken 01/16/14. The original signage for the split of Interstate 275 from Interstate 75 north from the 1980s. Photo taken by Gene Janczynskyi (10/25/00). More photos covering the south end of I-275 from I-75 north at Interstate 75 North – Manatee County on AARoads. Florida’s Interstates: A Half-Century of Progress http://www.fl-interstate.com (official Florida Department of Transportation site).